Make yourself at home in one of the 8 individually decorated guestrooms, featuring kitchenettes. Your pillowtop bed comes with Egyptian cotton sheets. 42-inch flat-screen televisions with cable programming provide entertainment, while complimentary wireless Internet access keeps you connected. Private bathrooms with shower/tub combinations feature jetted bathtubs and designer toiletries. Pamper yourself with a visit to the spa, which offers massages, body treatments, and facials. You can take advantage of recreational amenities such as an outdoor pool and a sauna. Additional features at this hotel include complimentary wireless Internet access, concierge services, and gift shops/newsstands. Guests can catch a ride to nearby destinations on the complimentary area shuttle. With a stay at Basin Park Hotel and Spa, you'll be centrally located in Eureka Springs, steps from Eureka Springs City Auditorium and within a 5-minute walk of Eureka Springs District Court. 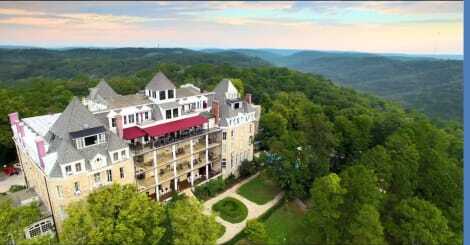 This spa hotel is 0.3 mi (0.5 km) from Eureka Springs Historical Museum and 1.6 mi (2.5 km) from Great Passion Play Amphitheater. Make yourself at home in one of the 14 individually decorated guestrooms, featuring kitchenettes with refrigerators and microwaves. Flat-screen televisions with cable programming provide entertainment, while complimentary wireless Internet access keeps you connected. Private bathrooms with shower/tub combinations feature jetted bathtubs and complimentary toiletries. Conveniences include separate sitting areas and coffee/tea makers, and housekeeping is provided daily. Take advantage of the bed & breakfast's room service (during limited hours). A complimentary full breakfast is included.